Garnering a Bachelor’s degree in Musical Theatre from the Australian Institute of Music sent Eldon on a melodious path right into our music-loving arms. 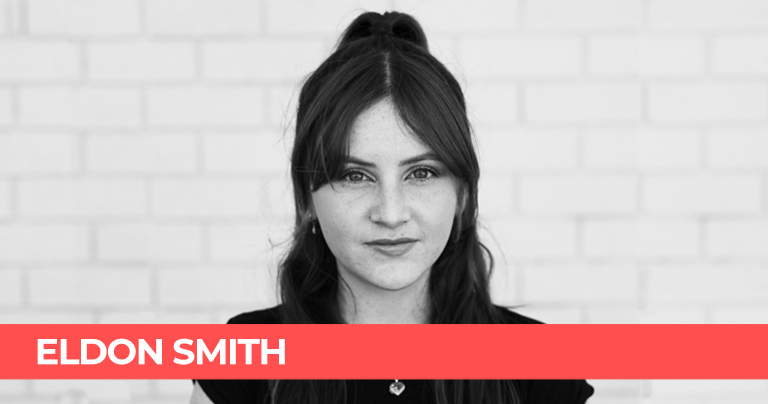 She polished off her skill set with a Cert IV in Graphic Design and then headed out into the wide world, building experience with a number of well-loved brands like Maison Blanche and Fossil. For Eldon content is King and it’s also customisable. There’s so many voices out there and Eldon’s talent lies in finding the right one for every brand. Couple that with her passion for the music and entertainment industry, and we’ve got ourselves a woman that is custom-made for the Jaden Digital lifestyle. A character chameleon with creative flair and pinpoint precision, Eldon has managed to marry her love for music and content for the benefit of every project she touches. Yes! I love food, and I love to cook. Usually with a glass of wine in my hand. My go to recipe (and favourite meal of all time) is chorizo carbonara, can’t get enough of it. London, for fashion, food and theatre. Which superhero would you want to be? Are the power puff girls superheroes? I’m going to say yes, I’d be Blossom for sure. Let’s kick it off with a morning at the spa, followed by brunch (bottomless). I’d definitely go shopping, and have dinner somewhere deluxe. Finished off with a night at the theatre, and cocktails with a view. What’s the last song you busted out a groove alone to? What’s the most ridiculous thing you have bought? My very aesthetic bike which I’ve ridden about three times. What is your strangest obsession? Stationary, I am obsessed with nice pens and new notebooks. Finding the kitschiest brunch spot and getting the perfect gram, I’d win gold. What TV channel doesn’t exist but should? A Broadway themed channel with never ending musicals, I would binge watch that all day. RnB Fridays – yes or no? Yes. Every day is RnB Friday. Would you rather be always 10 minutes late or 20 minutes early? Twenty minutes early, but then I’d anxiously walk around the block twenty times. What was your first live music concert you attended? It was Jason Derulo and I had a great time. Don’t judge me. A solid workout with a very strong coffee as the light at the end of the tunnel.